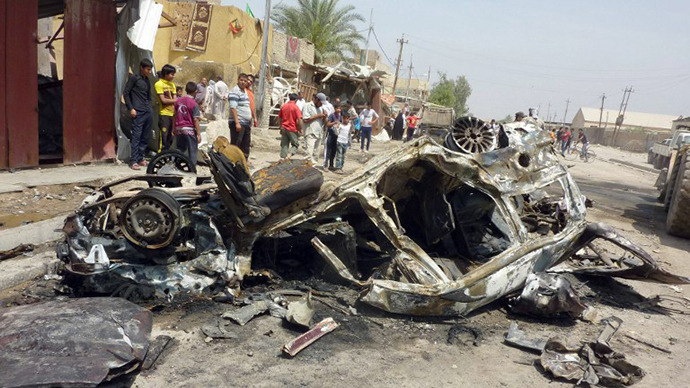 A string of bombings across Iraq has claimed at least 55 lives, injuring 300 more, on Monday. The surge in violence comes barely a week ahead of Iraq hosting elections for the first time since US withdrawal from the country. Officials said bombings hit 12 different areas, leaving 55 people dead and making Monday the country's deadliest day since March 19, AFP reported. The capital Baghdad and the surrounding area have seen 10 casualties, while the oil-rich Kirkuk, where tensions over resources have particularly spiked, has lost nine of its residents. The western Sunni city of Fallujah, the former Al-Qaeda stronghold of Baqouba and Saddam Hussein's hometown of Tikrit, also sustained attacks. 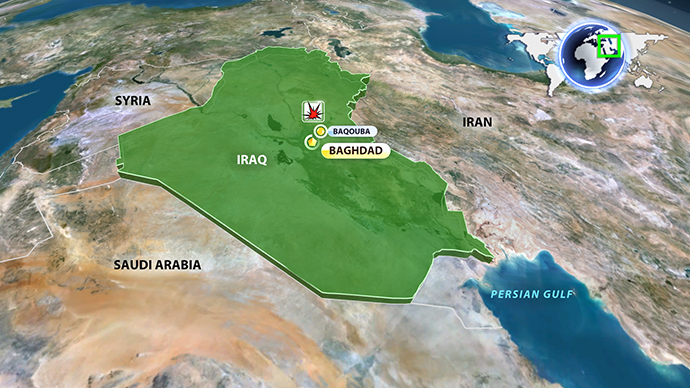 Most of Monday’s deadly explosions were car bombings, including two blasts at Baghdad airport. "Two vehicles managed to reach the entrance of Baghdad airport and were left parked there. While we were doing routine searches, the two cars exploded seconds apart. Two passengers travelling to the airport were killed," a police source said, cited Reuters. Witnesses blamed authorities for being unable to provide adequate security: “I blame those who call themselves politicians in government [and] the security forces… for this bad security situation. They are doing nothing to help the people, and are only looking out for their benefits,” said Qassim Saad, a Baghdad teacher who witnessed one of the blasts. Nobody has yet claimed responsibility for the attack. But, according to Reuters, the local wing of Al-Qaeda is in the midst of pursuing a campaign against Shiites and the government, aimed at stoking sectarian tensions. The bombing bears the trademarks of Al-Qaeda, which has carried out multiple coordinated attacks since the departure of US troops, completed in December 2011. As before, it involved an initial explosion, garnering the attention of police and emergency services, followed by a second explosion after their arrival. 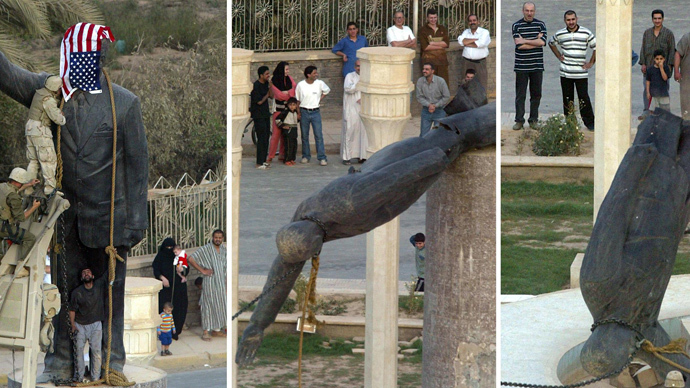 Al-Qaeda in Iraq was formed in 2003 in response to the US-led invasion of the country. Growing instability in Iraq emerged in the aftermath of US departure, which exacerbated inter-tribal and inter-ethnic conflicts. 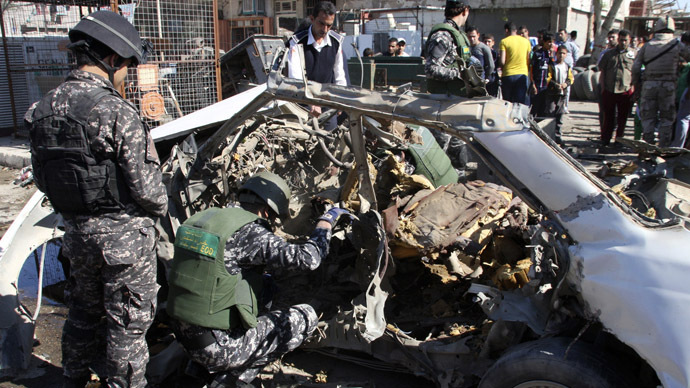 A reported 270 Iraqis were killed in insurgent attacks in March alone. The situation has worsened recently, with Sunni insurgents violently opposing the Shia-led government, and drawing support from the al-Nusra Front rebels fighting in Syria. AP says some Iraqi officials have pointed to the insurgents’ increase in coordination and cooperation with extremists fighting in Syria to topple President Bashar Assad. Iraqi militants have also been arming themselves through the now-highly-insecure Syria-Iraq border. Local elections, which are scheduled to take place later this week on 20 April, are the first since US troops left the country, and many think they will put Prime Minister Noure al-Maliki’s ruling political bloc to the test. The party’s popularity has been dwindling together with the rise in violence. Two Sunni politicians have been killed this past weekend, with dozens more losing their lives in the pre-election campaign. The almost daily blasts the country has witnessed threaten to put Iraq’s elections at stake, as many reportedly abstain from voting for security reasons, while recent weeks saw the deaths of 14 candidates in the provincial elections.